The Affordable Care Act is unpopular, but Texans don't want to get rid of it until they know what's going to replace it, according to the latest University of Texas/Texas Tribune Poll. Texans want to dump the previous president’s signature health care program, but only a small minority want to move on without replacing it, according to the latest University of Texas/Texas Tribune Poll. 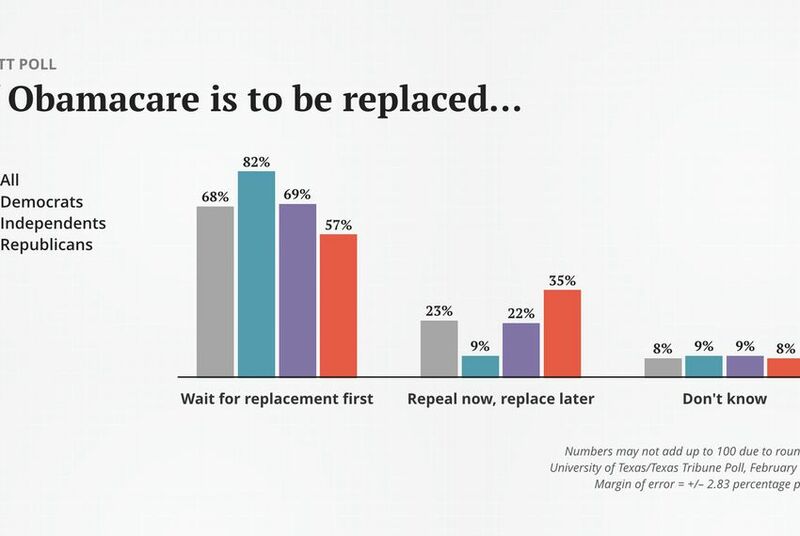 If the Affordable Care Act, better known as Obamacare, were to be repealed and replaced, 68 percent of Texans said lawmakers should wait until they have a replacement plan worked out before they repeal the current law. A smaller group — 23 percent — would repeal Obamacare immediately and figure out the details of a replacement plan later. That figure-it-out-first strategy is more popular with Democrats than with any other group, but a majority of Republicans and independents agree with them. Still, a third of Republicans and 45 percent of Tea Party Republicans said the ACA should be repealed immediately, even if a replacement hasn’t surfaced. Asked about the health care law generally, 52 percent said they would like to repeal it. Two-thirds of that group, asked what the next step should be, said they would replace the law with an alternative. Only 30 percent said they would repeal the law and not replace it at all. “There are many features of the Affordable Care Act that Republicans are not opposed to; in fact, they embrace Obamacare in a number of areas,” said Jim Henson, head of the Texas Politics Project at the University of Texas at Austin and co-director of the poll. “That’s why you don’t see a consensus around repealing without replacement or even repealing before a replacement is presented. “When you look at the large number of Republicans who want to repeal Obamacare but want to make sure there is a replacement, it underlines why Congress and the national leadership are moving cautiously,” Henson said. Thirty-five percent of Texans said the ACA should not be repealed, but only 25 percent of that group would leave the law as it is now. Most of the don’t-repeal contingent — 64 percent — said they would expand what the law does. Overall, 83 percent of Republicans and 18 percent of Democrats would like to see the law repealed. On the other side, 67 percent of Democrats and a scant 7 percent of Republicans would leave it be. Regardless of party flag, Texans who want the law repealed also want it replaced, a sentiment shared by 65 percent of Republicans, 64 percent of Democrats and 77 percent of independents surveyed. The University of Texas/Texas Tribune internet survey of 1,200 registered voters was conducted from Feb. 3 to Feb. 10 and has an overall margin of error of +/- 2.83 percentage points. The 623 Texans who wanted to repeal the ACA were polled separately about the next step; that group had an overall MOE of +/-3.93 percentage points. The 409 respondents opposed to repeal were also polled; the overall MOE was +/-6.85 percentage points. Numbers in charts might not add up to 100 percent because of rounding.